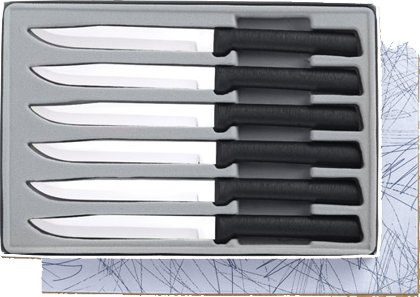 Six Non-Serrated 4 7/8 inch Steak knives Provides smooth cutting action for Filet Mignon, Top Sirloin and Ham Steaks. This is one of my most used knives in the kitchen. Wonderful Birthday gift. All items are made with T420 surgical quality, high carbon, stainless steel blade is engineered to stay sharp longer. The handles features a permantantly cast solid brushed Aluminum handle with a finger guard and a metallic satin finish. It is recommended that you hand wash & dry to maintain the shine of your cutlery. All Rada sets come in a beautiful velvet lined boxes and a lifetime guarantee from defects in materials and/or workmanship. Made in the USA. Box set do not come with cardboard sleeves they will need to be ordered separately or order items individually.